As with most of our work at the Government Digital Service, we release things early for review and comment. 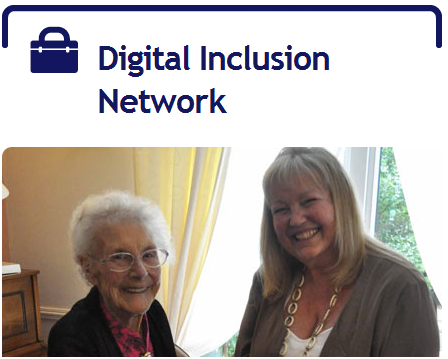 The digital inclusion team, set up last year,would like to share and get your feedback on an alpha version of a checklist for digital inclusion. We first mentioned a set of principles (we’re now calling it a checklist) when we published action 15 of the Government Digital Strategy. Over the last three months, this checklist has been developed in collaboration with partners from across government, private, voluntary and public sectors. The intention is for the checklist to act as a guide for any organisation involved in helping people go online. In other words, if you do these things, you’re doing digital inclusion. 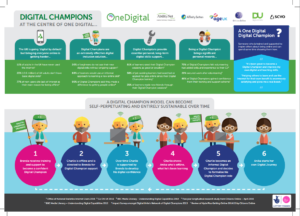 Alongside each of the six checklist items, we have included an illustrative example of what works and a potential action that could be included in the upcoming digital inclusion strategy. We are looking for feedback on the checklist from organisations and individuals who are involved in helping people, small businesses and small charities go online. We are keen to hear other examples from you that illustrate great digital inclusion in action. We also want to know what actions we should be taking. Like those we have identified from the examples here, please let us know what you would do. Net Literacy, Mary Riggs Community Center, and IPS are working to distribute computers repurposed at Broad Ripple Magnet High School to the families of K12 IPS students and to afterschool programs that support IPS. “Liz Odel,” said Daniel Kent, “has been leading the charge in facilitating the distribution of computers to dozens of IPS schools.” According to Kent, IPS families have received more than 200 computers last month and 100 have been staged to be transported by IPS Transportation to North West High School. In total, IPS families and afterschool programs have received more than 18,000 computers. “I’m really pleased that we are able to donate higher end computers to the K12 families,” Kent said. “All of the PCs are dual core machines with 2 to 4 Gig of Ram. They have plenty of horsepower for students to use them to complete their homework Word documents, Excel spreadsheets, and PowerPoint presentations.” Included on the computers is Open Office, and other applications that help students take advantage of their computers for school work. 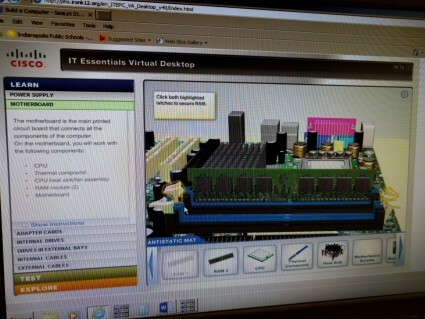 Harshman Middle School Uses Net Literacy Computers to Make STEM Learning Real World and Relevant! 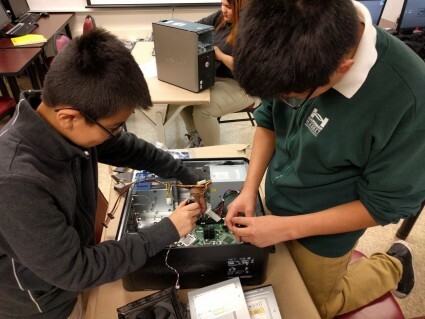 Students in Ms. Caren Lettofsky’s computer science classes, at Indianapolis Public School’s Harshman Middle School, learn about computers by reassemble their own computer. First, Ms. Lettofsky first has the students build a virtual computer, using a website created by Cisco. This site walks students through various steps to build a desktop computer. This part of the website gives hints and guidance as to what to do. 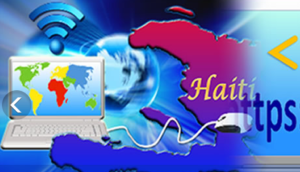 Once the students has completed this part of the website, the students then move to the next phase of the website and build the computer without any added help. Ms. Lettofsky also has the students complete a worksheet where the students must explain, in their own words, what the various parts of a computer does. Learning then becomes very real for the students. Students, in teams of two, work on computers provided by Net Literacy. First, each team completely disassembles the computer. Then the hard work begins as each team reassembles their computer. When each team believes they have reassembled the computer correctly, the team presents the reassembled computer to Ms. Lettofsky. The computer is then connected to a keyboard, mouse, and monitor and powered on to make certain that it was correctly reassembled and properly works! Finally, then the hard work begins as each team reassembles their computer and presents the reassembled computer to Ms. Lettofsky to make certain that it was correctly reassembled and properly works! Now for some of the students, here’s the best part! Students whose family doesn’t have a computer at home gets to take the computer they just reassembled (together with a monitor, mouse, keyboard, and cables) home! Students can now use their computer for homework and learning. This is very important because students with a computer at home are 7% more likely to graduate from high school. “It’s fun!” – J. D.
“I couldn’t believe it when my computer worked! I didn’t think I could do it.” – J. G.
“He’s been talking about this all week! He hasn’t been this excited about school for years!” – Grandfather of R. S.
Click on the link letters to Net Lit to read the students’ thank you notes to us! Net Literacy congratulates Harshman Middle School and Ms. Caren Lettofsky for teaching in an innovative and engaging real world manner! Posted in Digital Inclusion, Education, Net Literacy, North America1 Comment on Harshman Middle School Uses Net Literacy Computers to Make STEM Learning Real World and Relevant!